Last year I joined the Strong City Preservation Alliance. Strong City is a small town (very small, population 455) in Kansas. I have lived here since 1996. 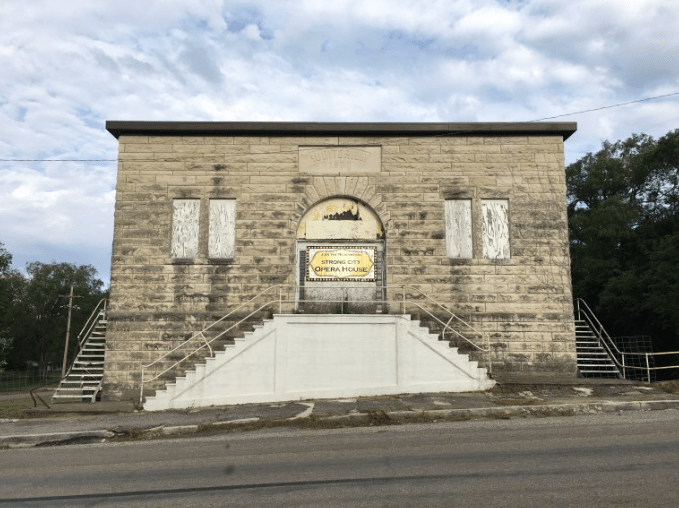 The Alliance has been focused on restoring the devastated 1900 Auditorium, and I suggested, of course, a blog. The blog went live today with its first post. The 1900 Auditorium in Strong City, Kansas. Kudos for spearheading the lastest efforts last Saturday & also to your fellow volunteers!! The arched window above the entrance with original glass & the limestone exterior are lovely!! Also I have insight as to my hunches & feelings about your wishes & fondest desires which I pray for daily. I think a philanthropist of old money is going to come your way & who has a strong sense of self & fruits of the Spirit. This wonderful person will adore you & be devoted– someone to share your life &dreams such as Cross House & other preservation/restoration dreams!!! The contentment of the Cross House & the calm settled spirit of yearning you had your whole life up until then will culminate in this fulfilled dream!! Looks like a worthy endeavor, Ross. Good luck to you and everyone involved! I look forward to following the blog about the restoration, especially if you are doing the writing.